(Nanowerk News) Research reported in the Applied Physics Express describes the observation of spin-to-charge current conversion by spin pumping from a ferromagnetic permalloy to a Cu/BiO interface. The metal/insulator interface makes it easier to control the spin-charge current conversion with an external electric field. This research is featured in the May 2016 issue of the online JSAP Bulletin ("Experimental observation of spin-to-charge current conversion at non-magnetic metal/Bi2O3"). Devices based on spin currents rather than charge currents, offer interesting technological opportunities, such as future high-density, ultrafast and low-power magnetic memory devices. Conversion between charge and spin currents is key for exploiting such “spintronics”. Researchers at the University of Tokyo and RIKEN in Japan have now demonstrated spin-to-charge current conversion by spin pumping from a ferromagnetic permalloy (Py: Ni80Fe20) to a Cu/Bi2O3 interface. 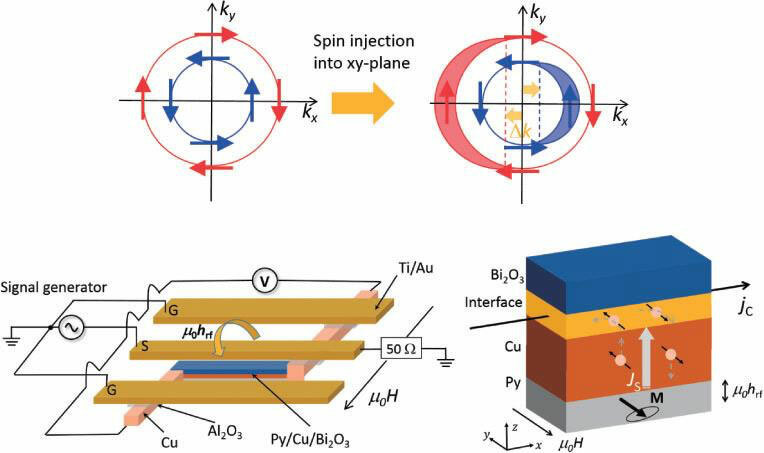 Importantly Cu/Bi2O3 is a metal/insulator interface, making it easier to control the spin-charge current conversion with an external electric field in the future. One way of converting between charge and spin currents is by exploiting the interactions between electron’s spin and its motion, described as spin-orbit coupling (SOC). Heavy metals typically have large SOC but while spin-charge current conversion has been observed at Bi/Ag interfaces, applying an electric field at a metallic interface poses difficulties, hindering the possibility of controlling the conversion electrically. Karube, Kondou and Otani fabricated trilayer 5 µm by 200 µm strips of 5 nm thick Ni80Fe20 (Py), 10 nm thick Cu, and 100 nm thick Bi2O3, and induced a ferromagnetic resonance in the Py using a Ti/Au waveguide alongside the multilayer. The voltage across the strip was then measured by sweeping the in-plane magnetic field applied perpendicular to the strip during application of 9 GHz rf current in the waveguide.